Received a pack-n-play today from one of Jess’ friends from work. Can’t thank everyone enough for everything so far. I brought it inside tonight and of course comes over the curious kitty. I am really starting to understand why they said curiosity kills the cat. 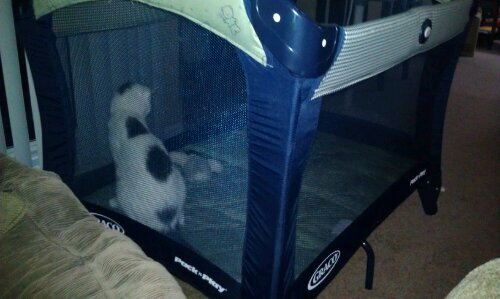 Anyway, we put it together and turned it into a cat jail. Surprisingly it took her a long time to get out. Going to be interesting with the baby because now she keeps jumping in and out, joy.